One-directional tree (data structure) in which every non-leaf node is labelled with the hash of the labels (or values in case of leaves) of its child nodes, until a only a single hash remains at the top of the structure, known as the merkle root. In the figure above, the leaves are the 8 boxes at the bottom which have no children branching out beneath of them. A cryptographic hash function processes each leaf value to produce a hash output. This is then paired with another hash and run through the cryptographic hash function again to produce yet another hash, and so on moving up the tree, until only the merkle root (a[3,0]) remains. 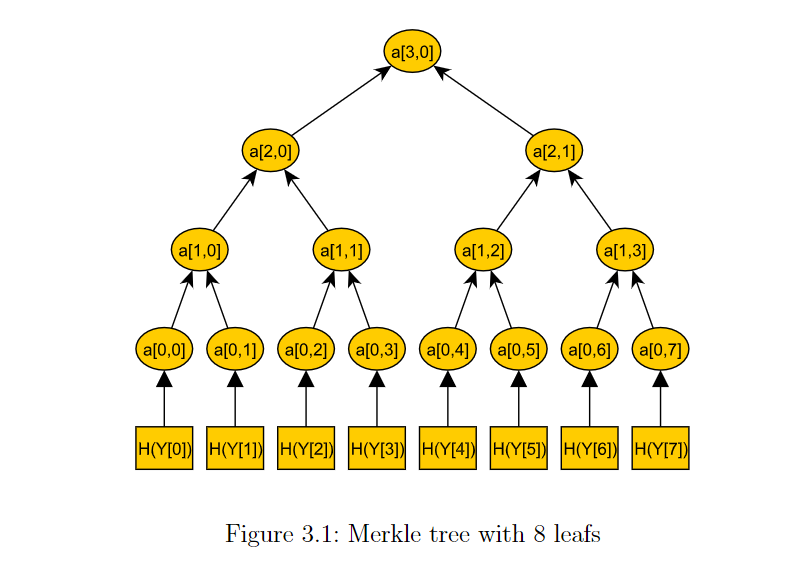 If a value of a leaf or non-leaf hash changes, the change impacts the hashes of every parent node in its branch all the way up to the top of tree, making it immediately obvious that the change has occurred simply by looking at the merkle root. Providing a means of data integrity / validity. Condensing large amounts of data so that less memory / disk space is need to store it and it's easier / faster to transmit across a network. Proofs are computationally easy and fast.